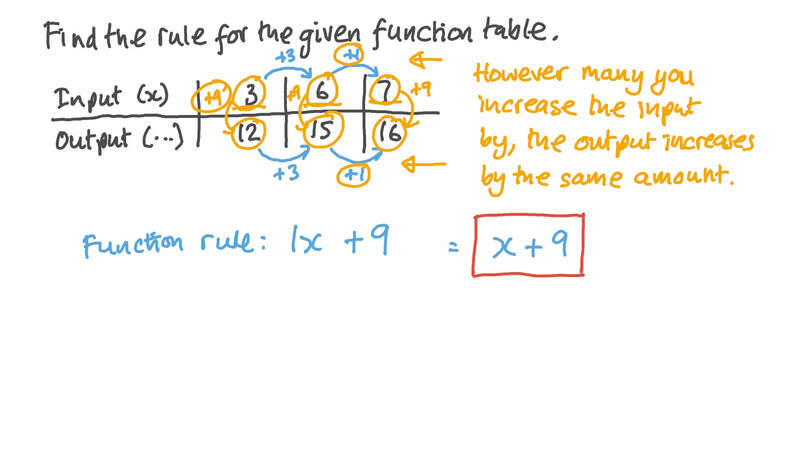 In this lesson, we will learn how to determine function rules and use that to solve problems. Find the rule for the following function table. 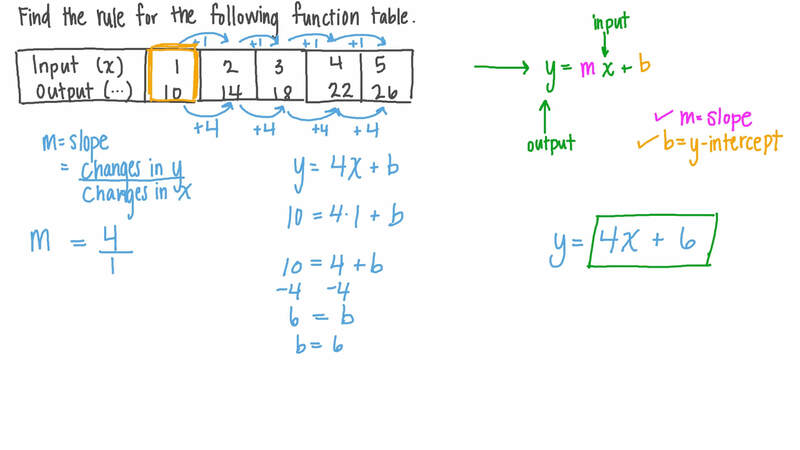 Find the rule for the given function table. Find the function rule for this table. 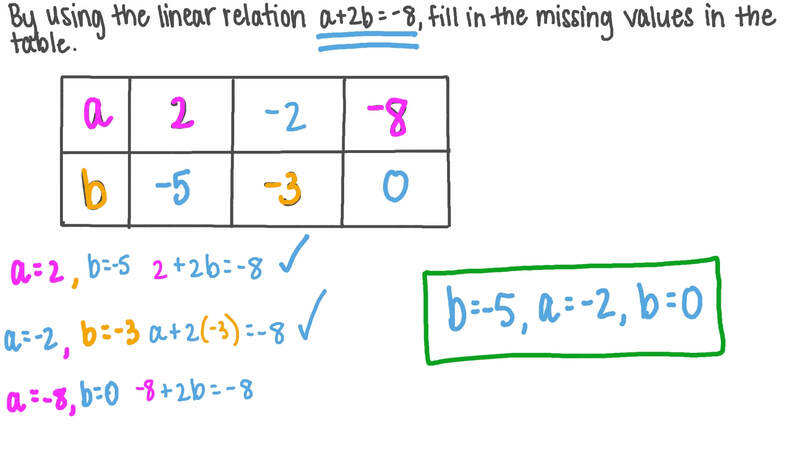 Then calculate the two missing numbers. 76 82 88 ? ? By using the linear relation 𝑎 + 2 𝑏 = − 8 , fill in the missing values in the table. Sally prepared 42 sandwiches for her guests. Write a function rule that relates the number of sandwiches per guest to the number of guests. Let represent the number of guests and represent the number of sandwiches per guest. The given table shows the fee for borrowed books that are overdue at a library. Determine which expression could be used to find the fee for a book that is 𝑛 weeks overdue. Sameh is trying to choose a car rental company. The relationship between the number of rental days and the total cost of the rental is linear for each company. Write the corresponding linear functions that describe each car rental company’s total cost. At a flea market, a woman sells her homemade hacky sacks. She paid $10.00 to have a stall erected at the market and makes $20.25 for every hacky sack she sells. Write a function for the money she earns. A group of friends want to go cycling and are trying to choose a bike rental company. Rental A charges $10 per hour plus a rental fee of $5, whereas rental B charges $7 for 1 hour and $25 for 4 hours. Given that the relationship between the number of hours and the cost is linear for both bike rental companies, write the corresponding linear functions that describe the total cost of each company. Rania is trying to decide which pool to go swimming in. There are two nearby pools: pool A, which has a membership fee of $150 and charges $7 per visit, and pool B, which charges $260 for 15 visits and $316 for 22 visits. Write the corresponding linear functions that describe each pool’s total cost for swims. By using the linear relation 𝑎 + 2 𝑏 = 8 , fill in the missing values in the table.